Michigan welcomes Michigan State to Crisler Arena as the Wolverines slowly watch their season slip away into darkness. 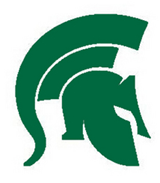 Conversely, Michigan State is playing their best basketball of the season in the midst of a 7-0 start to conference play. It appeared that Michigan might have rejuvenated their season with a home win over Connecticut but they followed that up with disappointment. The first blow was a crushing collapse in Madison that saw Michigan let a 9 point second half lead slip away. The loss in Madison was followed by Manny Harris’ practice incident which led to his suspension and a blow out loss at Purdue. On paper, last week was just a pair of road losses to the #2 and #3 teams in the conference. That doesn’t seem like it should be something to be ashamed of but there is no doubt that this team is on life support, gasping for their final breaths. Michigan State’s offense has actually been better than their defense. It should come as no surprise that Michigan State’s offense still relies heavily on offensive rebounding, the Spartans rebound 40.8% of their misses (9th nationally). They also shoot the ball very well, mostly because of their proficient shooting inside the arc (53.2%) where they take almost 75% of their shots. Michigan State also dominates the glass on defense (rebounding over 70% of their opponents misses) but they also keep their opponents off the free throw line (28.1 FTR, 23rd nationally) and force them into low percentage shots. 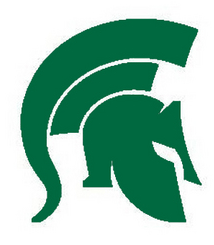 Michigan State’s opponents are shooting only 30.8% from three point range and that doesn’t bode well for the three point happy Wolverines. 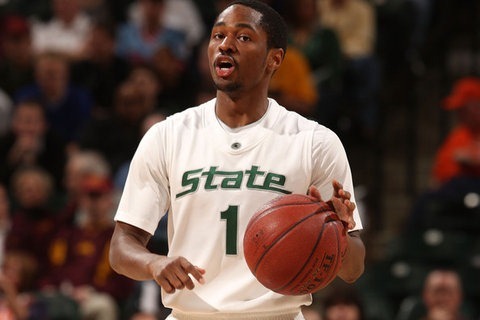 In the backcourt, Michigan State will start Kalin Lucas (16 points, 4 assists) and Chris Allen (10 points, 3 rebounds, 2 assists). Allen struggled at times early in his career but has put it together on both ends of the floor this year, becoming a defensive stopper and averaging 10 points per game (39.3% 3pt shooting). Kalin Lucas, well, he’s Kalin Lucas. Michigan has struggled to stop opposing point guards from getting in the lane this year and Kalin Lucas should be more of the same. Lucas-Perry, Morris, and Douglass will all get their shots but I’m less than optimistic that any of them can stop, or even slowdown, Lucas. On the block, Delvon Roe is the guy who killed Michigan last year with one of his career best performances in Crisler Arena. Derrick Nix and Garrick Sherman are intriguing freshman but KJ tells me (via IM) that he thinks they will have lots of trouble handling Sims on the block and expects them to play sparingly. 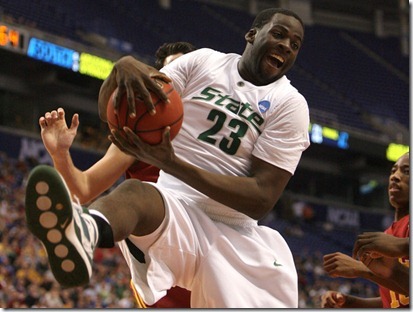 Then you have Draymond Green, who is easily my favorite Spartan. Green will play down low, mostly at the four position, and is the straw that stirs the drink in East Lansing. Green averages 10 points, 8 rebounds, and 3 assists per game and will be an extremely tough match-up for Zack Novak. When Michigan State offer Draymond Green a scholarship, the internet argument was that the offer was to prevent him from going to Michigan when it appeared he was on the verge of a commitment. It’s interesting to see Tom Izzo essentially admit that he got lucky with the recruitment and that he had his doubts about Green’s ability to play at this level. I saw Draymond play in a Christmas tournament versus Manny Harris during Green’s junior year and it was clear the kid could play. His basketball IQ and passing ability is off the charts and his success this yearly in his career is a testament to his work ethic and ability. Raymar Morgan (11 points, 6 rebounds) and Durrell Summers are Michigan State’s main options on the wing. Raymar Morgan can play on the wing or move to the four spot. Summers has been up and down this year but is certainly a capable wing scorer who can get hot at any time. Both Morgan and Summers will also likely get their shots at guarding Manny Harris. Last year’s contest was extremely ugly, a 54-42 Michigan State win, as Sims was really the only person to get going for Michigan. Michigan needs Harris and Sims to play well to have a chance. If they want to actually win it, some of the complementary players will have to step up as well. I would expect healthy doses of ball pressure on Michigan’s tentative guards because Tom Izzo has almost certainly seen tape of the turnover problems that Douglass, Lucas-Perry, and Morris have developed. If Michigan can hit a few shots and keep their turnover percentage under 20% they have a chance. Michigan State is also very good at completely eliminating at least one star player out of the offensive picture. Manny Harris always received the Travis Walton treatment and while Chris Allen is no Walton, you can be sure Michigan State will have a strong defensive plan in place for Harris. Defensively there are so many options to stop that a couple of them are bound to have success. Michigan just can’t let three guys get hot like they did in West Lafayette. Prior to the Purdue game Michigan’s defense had improved quite a bit, holding Indiana, Connecticut, and Wisconsin under one point per possession. Michigan needs to find this defensive effort again, especially on the defensive glass, and play with that sort of intensity for 40 minutes. It’s really all or nothing for Michigan here. Their season has been a colossal disappointment and beating Michigan State is one of the last opportunities to spark any kind of a run. Even if it doesn’t spark a run, it would be John Beilein’s first win over Michigan State which has to count for something.